In addition to consistent practice and meditation technique, with equal importance is probably proper body alignment and comfort. There are various options for meditation postures. Understanding proper body alignment is important and which cushions facilitate proper body alignment allows you to sit correctly and comfortably, allowing deeper meditation. Which Meditation Posture is Right for You? It is important to find a meditation position that is most comfortable for you and your body type. What works best for one may not suit another. Find a position offering you the greatest stability and proper body alignment of the head, neck, shoulders and spine. Maintaining proper body alignment is a key component in being able to lengthen your time sitting in meditation. If your mind is focused on body aches and discomfort, the goal of achieving a state of deep meditation can remain elusive. Full lotus – where the right foot rests on the left thigh and the left foot rests on the right thigh. Half-lotus – where one foot rests on one thigh while the other leg is folded underneath the other. Burmese – where the knees are bent and both legs are folded (but feet are not resting on the thighs). Kneeling or Seiza – knees are shoulder-width apart with the buttocks supported either by the heels, a zafu (sitting cushion) or other cushion, or a low sitting bench. Kneeling is often more comfortable for people with less flexibility in the hips and is the easiest position to get in or out of. Chair sitting – Keep your feet shoulder-width apart on the floor. If you have trouble with your back, use a cushion, such as a zafu, to support the lower back. Otherwise, sit toward the front third, away from leaning back. Both feet should be feel flat on the floor directly below your knees at approximately a 90 degree angle, if necessary use a cushion to elevate your feet. This is likely going to be the most comfortable position for most Westerners. It is not necessary, and even ill-advised, to force oneself into one of the above in order to meditate. In all sitting meditation postures, it is important to keep the spine straight with the lower part of the back curved. Thighs should slope down from the pelvis to the knees enough to tile the pelvis forward and provide needed support for the lower back. Keeping the spine straight allows the diaphragm to move freely allowing breathing to become deep, easy and natural. Can I lie down to meditate? The answer is that while lying down posture for meditation is certainly an option, it is not generally recommended for meditation unless you are well rested. There is a tendency to fall asleep when lying down, which defeats one of the purposes of meditation which is to raise our awareness, energy, and consciousness. The sitting postures will largely depend on your comfort level and flexibility in getting in and staying in a particular posture. The full lotus and half lotus require the most flexibility. Often beginners at meditation will experiment with a few before picking one or two favorites. Whatever position you choose, it should allow you to be in an alert yet relaxed position where breathing and circulation can flow optimally. 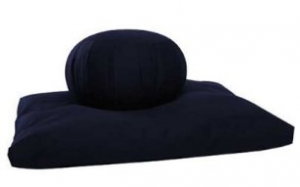 There are many meditation cushions available on the market in a variety of shapes, sizes and with many different fill materials to support proper alignment and comfort in meditation. It is beyond the scope of this article to discuss all of them so we will focus on few of the most popular choices. Some things you will want to consider is your own height and flexibility, the height of the cushion, the fabric (ideally durable yet soft) and how well the filling supports your body. The Zafu, the traditional round pleated cushion, raises the hips and upper body so that the legs can rest comfortably. It can be used in kneeling or seiza position but is typically used for Burmese or cross legged position. One should sit on the edge of the zafu so that the thighs slope down slightly. This posture will help to rotate the hips forward creating the natural curve in the spinal column. When the spinal column is in its natural alignment, the back, shoulders, neck and head will take on a comfortable upright posture that is easy to maintain during meditation. When used alone, the zafu is well suited for persons of average height and who have normal to above average flexibility. Taller people and those with more limited flexibility tend to benefit from a higher sitting position. A rectangular meditation cushion can be used with the zafu to increase height and allow for positioning of the cushions to produce proper alignment. The rectangular meditation cushion can be used alone or in conjuction with a Zabuton to provide an additional lift. It’s rectangular shape makes it easy for stacking. This simple cushion is not as high as the zafu and it is often the preferred choice by those with greater flexibility or who are of average height or lower. The zabuton meditation cushion provides cushioning for the knees and ankles during sitting meditation. This cushion is designed to be placed under the zafu or other sitting cushion. Proper alignment of the body in the sitting posture can create some additional pressure on the knees and ankles, and the zabuton helps to cushion these pressure areas. The crescent zafu is ideal for sitting in the cross legged or in the Burmese position. An advantage to using this type of meditation cushion is that it provides more surface area for sitting, and elevates your legs which helps prevent them from falling asleep – a common problem for many practitioners. The height of the crescent cushion can be adjusted by adding or removing the fill from an opening in the back of the cushion which can make it a good choice for larger people. Meditation benches are portable and are appropriate for those who are less flexible and need more sturdy support. Other accessories, in addition to benches, are available for comfort, correct spinal alignment and support, assisting in deeper meditation and safe posture. Two different, yet popular choices for fill are Kapok and Buckwheat hulls, each with its own merits and characteristics. Kapok is a soft, cotton like material that comes from the Kapok tree. When inside a cushion, the downy-like material becomes more firm and dense. The advantage to using kapok as a fill is that it does not become compressed like cotton or other foam filled products. It is light in weight and has some pliability so that it can conform to the body to a certain extent without too much give so it still provides support needed to keep proper posture. Buckwheat hulls are dark, small and saucer shaped. When the hulls are in the meditation cushion, it feels like sand but without the heavy weight. The advantage to choosing a cushion that is filled with buckwheat is that it conforms quite easily to your body and gives you a grounded feeling during meditation practice. Cushions filled with buckwheat hull often feature a zippered opening that allows you to adjust the level of hulls to your comfort which can be a plus. The stability and pliability that this fill provides tends to make it a preferred choice amongst those who practice meditation on a regular basis. Taking a little extra time to figure out the right meditation posture and cushion for your body can really help you to stick to your meditation practice by providing a more comfortable and, ultimately deeper and more satisfying, meditation experience! Although a zafu sounds comfy, I’ve heard that using a meditation bench a good to use as well. I think it depends on preference. I’ve heard that meditation has more flow if you’re comfortable.